There may be affiliate links in this article on how to use Pinterest for beginners, read the full disclaimer here. 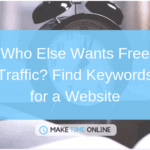 As you start reading the beginning of this article you find yourself wondering what it would be like to receive regular free traffic from Pinterest. You’re intelligent enough to know that some people use Pinterest to drive most of their traffic to their blog. The further on you read you’ll begin to understand how this is possible. If you’re anything like me you’ve probably not used Pinterest much. The little time you have spent on it has been wasted by pretty pictures of barn weddings and girly stuff. So why bother to use Pinterest? Because it’s business model is designed to connect users to content. No other BIG social media platform is designed for this. Any social media can be a great way to drive traffic to your website, especially if you already have a “presence” on there. However, Pinterest really takes the biscuit for getting new visitors to your website. A pin that is months or years old can still bring traffic to your website. Snappa costs $10 a month (or you get 5 downloads for free each month). Bookmark different designs you use so you can quickly find the layout you like. If you want a transparent background (especially for logo designs) use this website for free. Snappa basically can do all the above (minus the png compressor) in one place. But What Should Your Pins Look Like? I’m not going to waste your time here… but this is an important step for how to use Pinterest for beginners! Click your profile, click boards, click add board. The bit I do want to mention is what you should have on your board. …And no you don’t need to put your face on there! Build an Amazing website in under 30 seconds! This can cause some confusion! It’s easy enough to repin your own pin to a different board but a lot of people seem to struggle with rearranging pins WITHIN a board. Let me ask you this… Do you have certain posts that you want more people to find? So make sure you rearrange your pins on occasion so that your best pins are at the front of your board! There has been a couple of changes to Pinterest recently so check out this video to see how to rearrange pins on Pinterest. There’s no secret sauce here! Follow Pinteresters that you’d like to follow you! So this is the game changer! This is how Pinterest can help to drive so much more traffic than other social media platforms. Hold on a jiffy… What is a group board? You can become a collaborator on other boards. So if you are new and you get on a board with 10,000 followers then all of these people can see, share and view your pins! If you would like to know how to do this then I would recommend you start this free 7-day email course. This includes an email template of how to ask to become a collaborator and how to track who you’ve asked! The more you keep reading this article the more you begin to understand how to use Pinterest and how it can be a MAJOR traffic supply. Since you’re still here I’m going to assume you want to take Pinterest seriously. There’s a way to automate it so you only need to put in one hour a month once it’s going! Get on it like white on rice! I have a website and I always try to increase my traffic, Pinterest never came in my mind, I always look for other social networks. But now I know how much pinterest can be beneficial to earn you regular traffic. thank you so much for this useful post. It’s never been a strong point for me either but it is definitely a learnable skill. This was really interesting subject! I have to book mark your page so I can find it later. Thank you so much for these great tips. I have Canva already, but I have to start using it more often. I hope the course helps, let me know if you have any questions! This is a great rundown. And well timed. I’m on a lot of social media but Pinterest is one I never got around to, but have known I should. This should get me started, thanks! Yeah Pinterest is different to any other social media platform. It can seem a bit weird to start with but the group boards is a huge bonus! I love this website. Thank you so much. I will take your course eventually. Right now am in the middle of another one. Will be back often. I hope the course helps, do let me know if I can help with any personal questions!